One of the projects I usually do over the winter is to scan my bucket list for this years challenges. There are plenty of experiences on the list that I plan on having at some point in my life, but some are best suited for this particular year and I just get to pick out what they will be. An item that I have on this list, that everyone else has on their list, is to write a book. This would be a bazillion times easier to do if I waited until my very young children were older, but by then I may be old and gray and too forgetful to remember the story. I got straight to work. Thoughts and ideas starting racing through my brain and I started filling pages on the computer screen. I knew I wasn’t a studied author, but my words needed some fluffing. I could imagine the story in my head and it would be a prize winning novel and then it would hit the paper and crash and burn. To make a long story short, I am learning how to write. Any book titles, blogs or podcasts to help me out would be greatly appreciated! I know youtube is a fantastic tool, but that is really tough to work with off grid. So stay tuned…in a few years from now I may have a book being published! Why don’t you do something easier? Sneak peak at an upcoming project: egg to frogs. Here is another book I read this weekend, actually I finally finished the last chapter this weekend. It’s a woman’s story of leaving her life behind and becoming a farmer. I really should be spending my “free” time reading and learning rather then reading stories, but this was a great read for me. It helps to hear about people turning their lives upside down and succeeding. All the hardships they endure along the way are a kind of preparation for the things that will inevitably go wrong for us. How going back to the land is really hard work, but she stayed there for the love of it. And all about the love of her husband, of course. It makes me feel good to know that we are not the only “crazy” ones out there. It seems as though everyone they knew looked at them the way everyone we know looks at us. The look of “what are you thinking?” I have come to embrace that look these days. I just know we will be very happy in life, just like the family in this story, regardless of anyone else’s opinion. 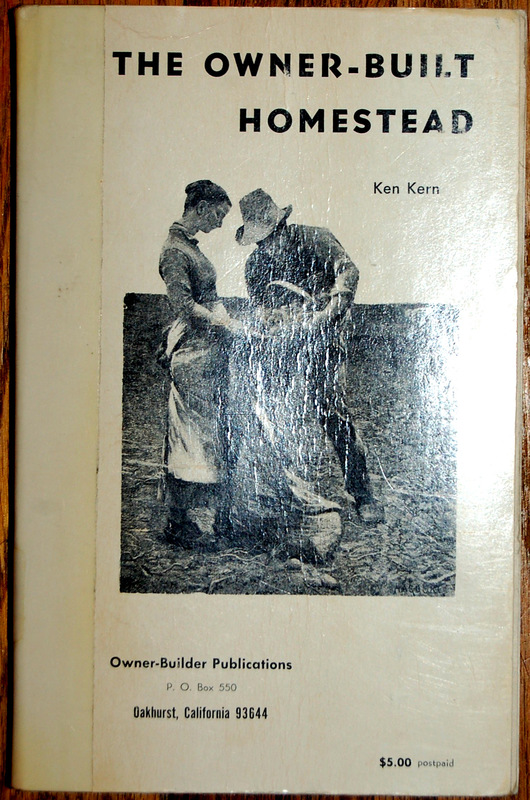 I just finished reading this book by Ken Kern. I found this book when it was mentioned in another book by the same author that I had started reading. It was a book about owner-built homes. This is what we plan on doing, but I think I may have been a step ahead of myself then. You need the homestead plan before you can go out and put a house on it, so I figured I would switch over to this book. I found that a lot of the lessons that this book taught were very similar to all the things I had learned reading permaculture books. The only difference is that they didn’t call it that. It was just how they did things. There were numerous moments when it was hugely obvious that the book had been written in the 1970’s, but nothing too far off either way. I have many pages folded over marking specific details of things that I’m sure I will need to know eventually. Things that hours of surfing the web would never have found. Or maybe I’m just better with books than computers and someone skilled would never had needed the book. I’m alright with that though. I greatly enjoy my folded pages. Either way, this book is loaded with good information and I’m glad I took the time to read it. 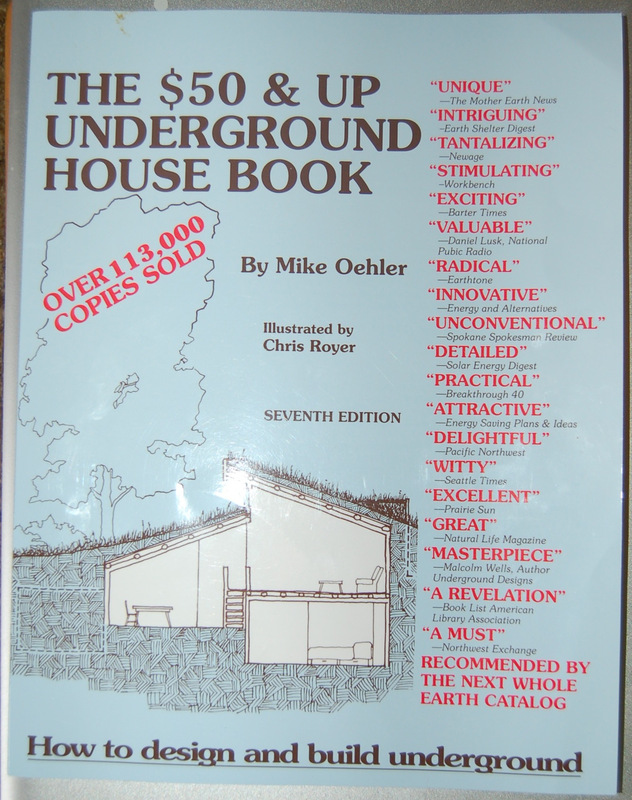 I just finished reading “The $50 and Up Underground House Book.” Mike Oehler is the author and designer of this book and the videos that go with it. We watched those too. I’m 95% sure that this is the type of house we will be building come spring or summer. Anyone thinking about maybe building a natural house of some kind really should read this book. If you are thinking about an underground house, you should definitely read this book. Everything he says really makes sense. He explains the process and the mistakes he has made to get to the process he uses. The how to design a house part was the best though. There is a packet that comes with the video with a printable design kit! I can’t wait to play more with that. I will post that part later. The only thing I wish there was more of in this book is the real basic stuff. He seems to write the book for people who already know how to build a post a beam structure. I don’t so I bought a separate book for that part. It seems like everything will come together fine though. More to share soon!